Six Flags Great Adventure's new looping coaster, fiery red El Diablo, will make its home next to the world's top-rated wooden coaster, El Toro, in the Mexican-themed Plaza del Carnaval section. 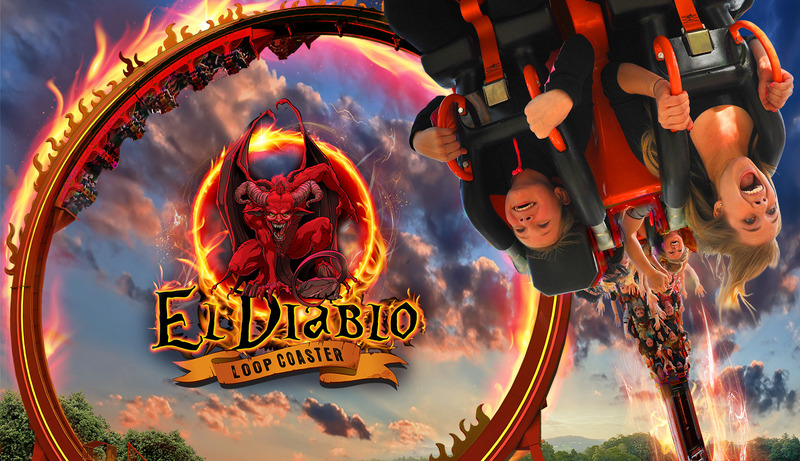 El Diablo is set to preview to Six Flags Season Pass holders and Members May 14 and 15, and will celebrate its grand opening to the public May 16. The devil is in the details for Six Flags Great Adventure‘s new looping coaster, set to open next week. The park’s 13th coaster bears a “devilish” theme – El Diablo. “The Jersey devil has deep roots in our state’s history, and inspired the theme for our newest thrill ride,” said Park President John Fitzgerald. The giant, fiery red El Diablo looping coaster will make its home next to the world’s top-rated wooden coaster, El Toro, in the Mexican-themed Plaza del Carnaval section. It features riders sitting in “face-off” seats rocketing forward and backward pendulum style until the train gains enough momentum to complete a full revolution seven stories in the air. The coaster then kicks into high gear, completing full revolutions until it stops momentarily with riders suspended upside down, and then reverses direction for even more thrills. Guests can experience six gravity-defying inversions before the train finally comes to a stop. “El Diablo is the perfect addition to Plaza del Carnaval, as it appeals to both thrill seekers and families alike. Rides like El Toro and Tango attract a wide audience to this area, which also provides ample opportunities for dining, shopping and relaxation from the excitement of the world’s largest theme park,” Fitzgerald added. El Diablo riders must be at least 48 inches tall. El Diablo is set to preview to Six Flags Season Pass holders and Members May 14 and 15, and will celebrate its grand opening to the public May 16, a week earlier than originally planned.